When we went to Australia, we did not budget. We had X amount of money in the bank and we pretty much spent it all. We ate out at expensive (compared to KY) restaurants and I did more than a bit of shopping. I was, of course, watching our bank account but it was not budgeting. Also, because I had just started my new job, I was not getting paid while we were away. When we got back, KC freaked out about the amount in our bank and cancelled our Chicago anniversary trip. I was upset, of course, but I knew it was the right decision because I don't think you should go on vacation if you can't afford it. When we went to Europe I knew I had to go about it differently. I created an excel spreadsheet and downloaded the excel app on my phone. I budgeted a certain amount for breakfast, lunch, dinner, snacks, shopping, hotel taxes that you can't pre-pay, transfers etc etc. I had booked a lot beforehand (tours, transfers) and paid for all our hotels out of 'normal' money and not Europe money. After every single purchase, I would open my app and change the budgeted to what we actually spent. Sometimes I would write it in my notebook or keep the receipt and do it later. I rounded up because I don't like cents. I budgeted $2,500 for our entire trip and we spent roughly $1,350. A lot of this has to do with the fact that Rome and Paris were much cheaper than I was expecting, especially in regards to food. Dublin was easily our most expensive city food wise. But another reason was that it was so helpful to see the expenditure right in front of me. Having the excel spreadsheet on my phone really helped us stay on top of our spending and ensure that we didn't return home with no money. However. 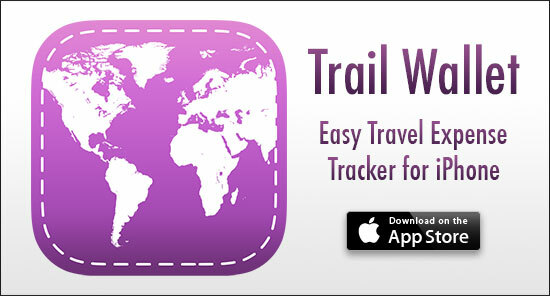 After we returned, I discovered a new app, Trail Wallet, which is so much easier to use. I really wish we had used this in Europe, but I was excited to use it for Disney and of course, for all our future trips. The bad news is that the app is only free for the first 25 items, so you need to upgrade ($3.99) in order to use it for unlimited amounts. Boo. It was worth it for me to purchase it rather than using the excel app, because it is simple, easy and pretty. I use Mint for everyday expense tracking, but I love having this separate app for trip budgeting. I'm sure you can use it for everyday as well, but I haven't tried and I prefer mint because it automatically records my spending and I'm lazy and don't want to have to input it myself. I don't mind inputting it myself on a trip because I want it right in front of my face. So I knew Disney would be more expensive per day than Europe, but I still wanted to keep it fairly reasonable. This doesn't include hotels, flights, tickets, transfers, everything was booked and paid for before we left. Our hotels were the most expensive portion of the trip, our flights were like $10 because of Southwest miles. Our travel agent (highly recommend, read why here!) organised all our hotels, transfers and tickets because she is amazing. Anyway, so we only needed this app for spending money and food. We purchased the Disney Dining Plan, so most of our food was covered. 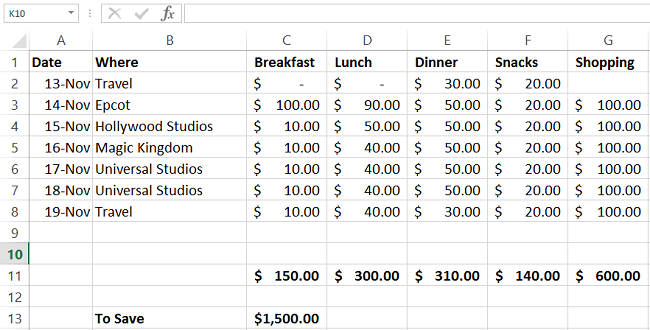 I created the same excel spreadsheet to first get an idea of how much we would spend and need to save. I prefer to over budget and come home with money (or get to shop a little more) than to be too realistic and have no room to move. In the numbers above, I was including what what we would have paid without the Disney Dining Plan. I was not planning on spending $1,500 on a week's vacation, I just like to over prepare. Once I had my budget for the entire trip, I created a trip in the app, entered the budget and dates. I created my own categories, DDP and OOP. DDP is for Disney Dining Plan and OOP is for Out of Pocket. Because we got the DDP, we had prepaid for a lot of our food. We still had to pay tips and for everything at Universal and airports. 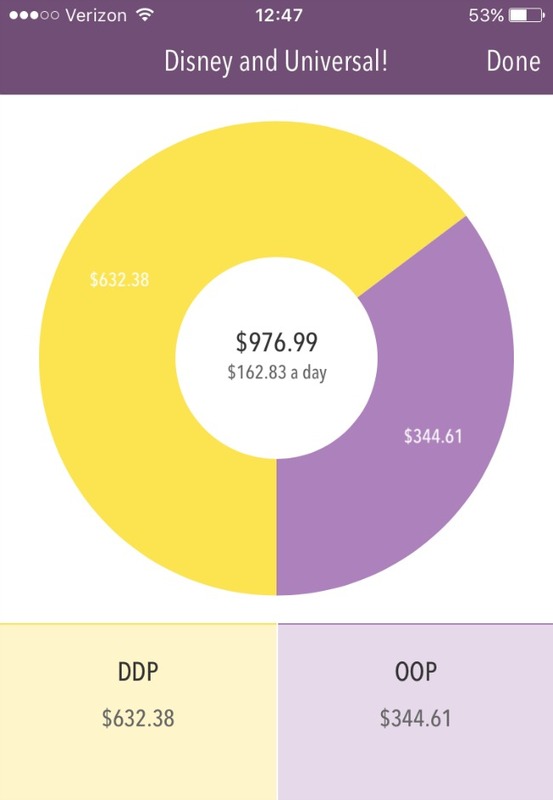 I loved being able to track how much we would have spent out of pocket had we not got the Disney dining plan (DDP is a bit cheaper than the value we got out of it). I also loved having it separated, so I could show KC exactly what we'd been spending. So we only spent $350 on a week trip. Not bad at all. We only had to pay for food for 2 days (and airports) and a few souvenirs / gifts. Obviously we also paid for the dining plan a couple of months ago, but it was less than the value we got out of it. This was a bit of a bad example because of the whole out of pocket vs not actually paying thing, but actually that's why I love this app, because I could do that. I could keep them separated. Next trip, I might switch up the categories into food, shopping, etc. If you are very responsible with money and you're able to keep track of everything while travelling, this might not be for you. But if you're like me and you need it to be right in your face and to constantly keep an eye on what you're spending so that you don't go overboard, you should check this out. Also, this is totally not sponsored, by the way. I just really dig Trail Wallet. Love this! Thank you for sharing this--I'm definitely going to look into using it to prepare for our Aruba trip since it's not all-inclusive. This is GOLD, lady! Pure gold. You know what I'm using this for! What a great app. I totally like to pay for my trips in advance so being able to budget and see what I am spending is a great tool. Ohh this sounds awesome! Sadly I feel like I don't travel enough to need to use it, but the next time we have any big trips coming up I am definitely going to download it because I can see how helpful it would be! This sounds like something that I would love to use on a trip in the future! & by the future... I mean next weekend :) Thanks for sharing! gosh i need one of these in my life. well all of it. i'm the WORST planner, even with money. but i'll tell you what - if i am in a pinch, this girl knows how to live on a tight budget. super rewarding to know you can do it too! This is such a cool app! I need to be better about budgeting...do you like using Mint/is it really helpful? I need this in my life! I have a feeling that we'll be wanting to go overboard when we go to Europe this year, and this would be the perfect way to help keep us in check so we're not surprised by the credit card bills! I think I have to try this! Thank you. You are the queen of budgeting! I would love to see an example of one of these trips and how you saved so much money! This is awesome! I need to be so much better at budgeting in general, but on trips I'm terrible and spend whatever wherever. Going to keep this for the next time I travel! Man, you sure did Europe on not a ton of money compared to what you budgeted. That had to be a nice surprise! This app sounds cool, I will check it out if we plan a trip! I am going to have to save this app for later! And girl, seriously impressed with your excel spreadsheet! I love this idea! I've started budgeting for our trip, but it can be overwhelming. I'm going to check out this app because I want to keep really, really good track of everything we spend for budgeting and educational purposes. This looks like such a good system! Thanks for sharing. I'm married to my spreadsheets but sometimes using the app on my phone just isn't good; I prefer to see it on the computer screen. But for trips, using an app like that to hold me to my trip budget rather than only thinking about the monthly budget would be great. This is amazing! I wish we would have had this for our honeymoon in Hawaii because we went crazy - but I guess you only get one honeymoon ;) Definitely saving for the future! I love this idea so much! I'm going to be doing more than normal traveling this year and for business purposes for much of it, this will be very helpful in keeping track of what I'm spending. This is awesome and I will definitely be downloading it! I'm constantly reassessing our weekly budget but never broke down a travel budget before but this is a great idea for future trips so you stay on track. I will check out the app. Interesting. I'm horrible with budgeting. I always think I'm going to sit down and budget what we spend each month and all that, but I never do. When we go on vacation, we don't really track anything either. Zack does a little more than me, he basically says "So I'm thinking we'll spend about x amount on food each day" and we still just do whatever. We've never done the Disney Dining Plan. We also just buy one meal and share, so we don't end up spending much on food. This is brilliant. Such a great idea. I always panic on trips because I feel like we are spending so much, so this tool would be really helpful! What a neat app! I don't usually track too much on vacation but am mindful not to have crazy expensive meals every day. I keep a separate bank account as my "vacation fund" and keep in mind what I have in there before planning trips. I should probably be better about keeping an eye on my spending! This is genius! You are a budgeting queen, lady! Thanks for sharing. I can see why this would be really helpful. This is awesome -- you are the absolute best at trip planning and using money smartly! What a great (non-sponsored, LOL) product review and it sounds like a really great app! Sort of a side note, but I feel like people can be a little bit unreasonable about expecting every app to be free! $3.99 sounds perfectly reasonable to me for a useful product!! That app looks pretty cool. I'll have to look into it for my Hawaii trip next spring! The trail wallet app looks super helpful! Great app! I want to be more budget-y on vacations too. It's crazy how expenses get out of hand REAL fast. I wonder if Android has anything similar. Bet it does! Whilst I do love an excel spreadsheet for all elements of my life, I have never kept and updated one before. In fact I've never actually budgeted as we go on a trip before, so I think I should probably start doing that. This app looks awesome - may well investigate pre our next trip... Thanks for the tip!